Call Six Brothers for house raising. Six Brothers provides the concrete pumping into the block column which will elevate your home. We can give you references to the top companies who will do the rest of the work for you. Preparing the home to be raised. Because of the tight angles under the house, pumping is the ideal way to pour the concrete. Call us if you need concrete in hard to reach areas including home lifting. Call Six Brothers for pumping to a second or third floor. We are much cheaper than a boom pump and yet, easily can do that job. Call us if you need concrete in hard to reach areas. Call us at 713-489-7862 if you need concrete in hard to reach area such as indoors, in basements, upstairs, on the other side of obstacles and where the pour is a long distance from the concrete. We can pump up to 200 feet. Houston Metro Area. 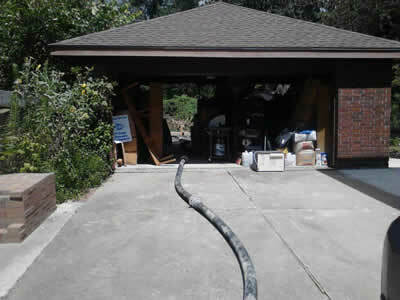 Note in this example, the concrete is pumped over the driveway and through the garage about 100 feet from the concrete delivery truck.